Forward -Link -Couriers is a one stop market place for all your delivery needs. Never again will you have to scour the internet for quotes. Just visit our website, post a job and the delivery service provider will come to you. Our Goal is to create a safe, cost- effective and hassle-free environment in which people can source excellent delivery, removal and courier service. It's all about you, the customer. Without you we have no business. We also believe in Delivery Excellence. this means making sure your goods are delivered with the upmost professional courtesy, on time and undamaged. We aim to achieve this standard of excellence by only having the very best and reliable delivery service providers. Not like the rest, its just the best. Simply the best courier service I have ever used. 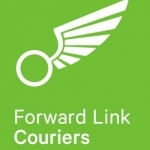 I was comparing parcel delivery companies and stumbled upon Forward Link Couriers, you can not tell that this company only started operating this year. Great customer service, smooth transaction, professional service through and through. Keep up the standards,you will go a long way.